an Internet service to meet their needs. Always on, no dial-up, no long distance charges, just easy access to the Internet. 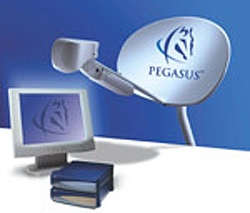 With only a small satellite dish, an IRU (Indoor Receiving Unit) and an ITU (Indoor Transmitting Unit), Pegasus Express will provide super-fast broadband Internet access, delivering connection speeds comparable with cable and DSL modems and much faster than dial-up modems and IDSN connections.